"Mirage distills the recognisable and repetitious suburban home into the essence of its lines, reflecting and disappearing into the vast western landscape," said Aitken. Aitken's design is based on the California ranch style of architecture. Informed by the modernist ideas of architect Frank Lloyd Wright, combined with the traditional ranches in the American west, the style was developed in the region by a group of architects in the 1920s and 1930s. "After World War II, the ranch style's streamlined simplicity gained popularity as commercial builders employed a simplified assembly line approach to create this efficient form, matching the rapid growth of the suburbs," said the artist. "The mass-produced ranch home became a familiar sight across the country, the style filling the American landscape as quickly as each new subdivision was built." Aitken reconfigured the idea of the suburban home by removing its inhabitants and their possessions. He has done away with the doors and windows so the structure is not private or secure. Inside, the reflective surfaces create a kaleidoscopic effect intended to evoke confusion rather than comfort. Desert X opened 25 February 2017 and runs until 30 April 2017, although Aitken's Mirage will remain in place until 31 October 2017. Other participants this year include artist Phillip K Smith III, who also uses mirrors to create large-scale, site-specific artworks. He previously added mirrored strips to the walls of a desert shack to create the illusion that you can see right through the building. 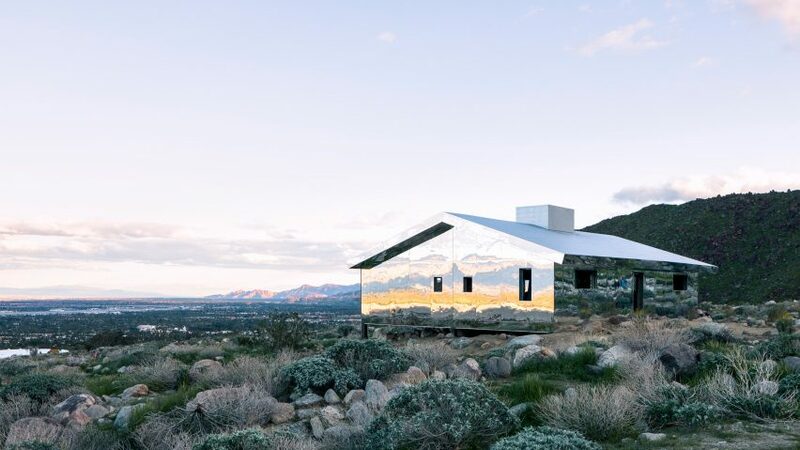 More mirrored buildings around the world include a reflective beach hut on the English coast and a crinkled stainless-steel extension to 1960s museum in Norway. Photography is by Lance Gerber, courtesy of the artist and Desert X.